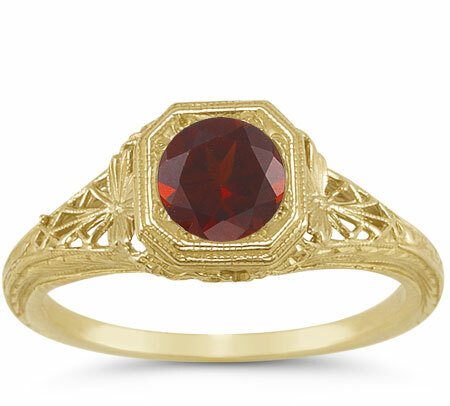 An original, deep red garnet gemstone is often a favorite, and really glitters in this latticed antique-style filigree deep red garnet ring in 14K yellow gold. This wine red garnet stone, round cut and AA rated, is 6mm in size, making it a perfect for every day wear! The 14K yellow gold ring features a lattice design, full of exquisite details that draw attention to the jewelry piece. Created to look like the original ring from the Victorian era, this design was made using some of the original jewelry making pieces! We guarantee our Latticed Antique-Style Filigree Deep Red Garnet Ring in 14K Yellow Gold to be high quality, authentic jewelry, as described above.